Triumph of Grace | ADULT CATECHESIS & CHRISTIAN RELIGIOUS LITERACY IN THE ROMAN CATHOLIC TRADITION: hosting ONLY True Christians!! !, or "How to think Catholic!!" “…Saint Dominic would spend whole nights weeping and groaning in prayer before the altar. Over and over again he would say, “What will become of sinners? What will become of sinners?” Saint Dominic’s great passion was to reconcile sinners by preaching the mercy of God. -and exultation in the Divine Mercy. Saint Dominic prayed constantly; he prayed at home and on the road, in church and in his cell. For Saint Dominic there was no place or time foreign to prayer. He loved to pray at night. He engaged his whole body in prayer by standing with outstretched arms, by bowing, prostrating, genuflecting, and kissing the sacred page. If you are not familiar with the extraordinary little booklet entitled The Nine Ways of Prayer of Saint Dominic, today would be a good day to find it and read it. Saint Dominic had a tenth way of prayer too: the Psalter of the Blessed Virgin Mary that today we call the rosary. The use of beads was widespread and the repetition of the Hail Mary were both widespread before the time of Saint Dominic. The Hail Mary prayed 150 times in reference to the 150 psalms was practiced in Carthusian and Cistercian cloisters before the time of Saint Dominic. Saint Dominic understood that preaching alone was not enough. Preaching has to be irrigated by grace, and grace is obtained by prayer. Inspired by the Mother of God, Saint Dominic interspersed his sermons with the Psalter of the Blessed Virgin Mary. He exhorted his hearers to continue praying the Psalter of 150 Aves as a way of prolonging the benefits of holy preaching. The rosary allows the seed of the Word sown by holy preaching to germinate in the soul and bear fruit. Divine Wisdom has so ordered things that the simplest material means — humble and adapted to our weakness — produce the greatest spiritual effects. Father Raphael Simon, the saintly Trappist psychiatrist, said that, “five decades of the rosary or even three Hail Marys daily may mean the difference between eternal life and death.” The effect of the rosary is entirely disproportionate to its simplicity. The fruits of the rosary are well known: among them are detachment from sin and from the occasions of sin, peace of heart, humility, chastity, and joy. The rosary, and all authentic prayer, is always realistic — that is to say, honest about human weakness and sin — and, at the same, full of hope — that is to say, open to the glorious plan of God’s mercy. 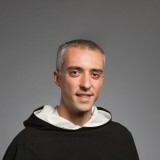 The tears of our Holy Father Dominic never fail to move and challenge me. 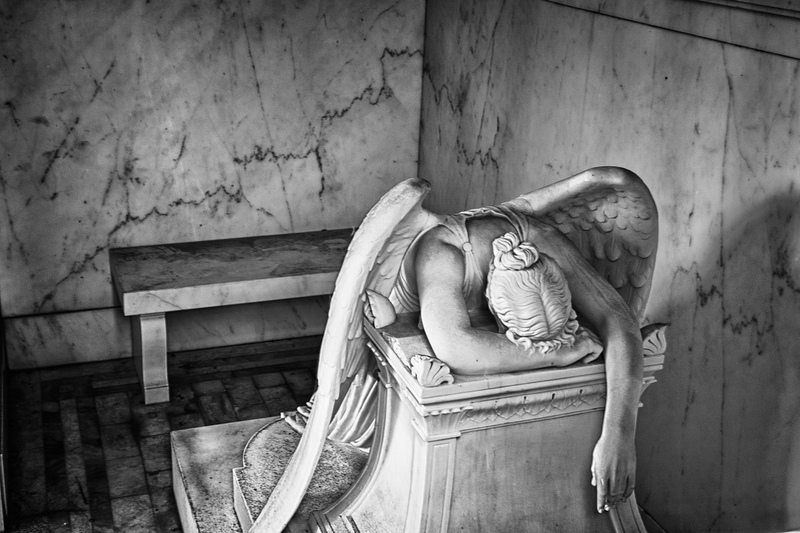 There is something haunting and mysterious at the thought of a man weeping in the solitude and silence of a sleepless night on the altar steps. Entering a church at night to find someone in such a state of fervent and distressing prayer is a moving and troubling experience. The state of crisis shatters the thin veil of our quotidian expectations to reveal the startling reality that we are still poor, banished children of Eve, living in the status viatoris, awaiting the glorious coming of Our Lord and the eternal beatitude of Heaven. The encounter with the soul in crisis reminds us of the reality of the cross that we are called to bear with Christ and with one another. Seeing another bearing such a burden awakens our Christian sympathy and draws us out of our private concerns to beseech the Lord of all consolation for his mercy and compassion. But what is the crisis that confronted Saint Dominic as he wept in fervent petition at the altar steps? Our holy father was not suffering from the betrayal of a spouse, the loss of a job, or the death of a loved one. His tears were not shed over a personal crisis, but rather the crisis of the “infidels and sinners” who reject the obedience of faith and do not enjoy the salvation offered by Christ. When we encounter the tears of our father Dominic, we are confronted with the reality that those who are closed to faith are lacking the possibility of true and lasting friendship with God, a friendship which requires filial trust and a loyal heart. Saint Dominic was brought to tears at the thought of a soul rejecting such a gift. In Dominic we see the beauty of a soul transfigured by faith, hope, and love in a state of fervent petition; more, we see a participation in the redemptive mission of Jesus Christ.